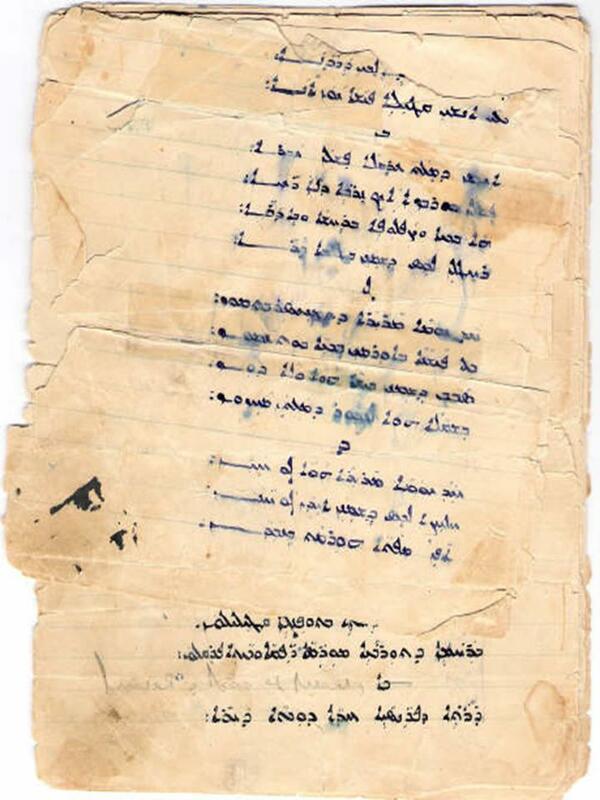 This poem was read by Mr. Sargon David at the Assyrian Chaldean Syriac Genocide Awareness Day (see News Digest), written by his great grandmother about her beloved Assyrian village of Golpashan in northwest Iran. Couldn't Say It Better Myself ! Thanks to the efforts of many Assyrian friends in Washington and across America, Ms. Ashtar Marcus and Mr. Michael Youash in particular whose article appeared in the last issue, only two days before the presentation of the draft of the Iraqi constitution a special report on Assyrians, Chaldeans, and Syriacs of Iraq appeared earlier today on the National Public Radio's broadcast of All Things Considered. 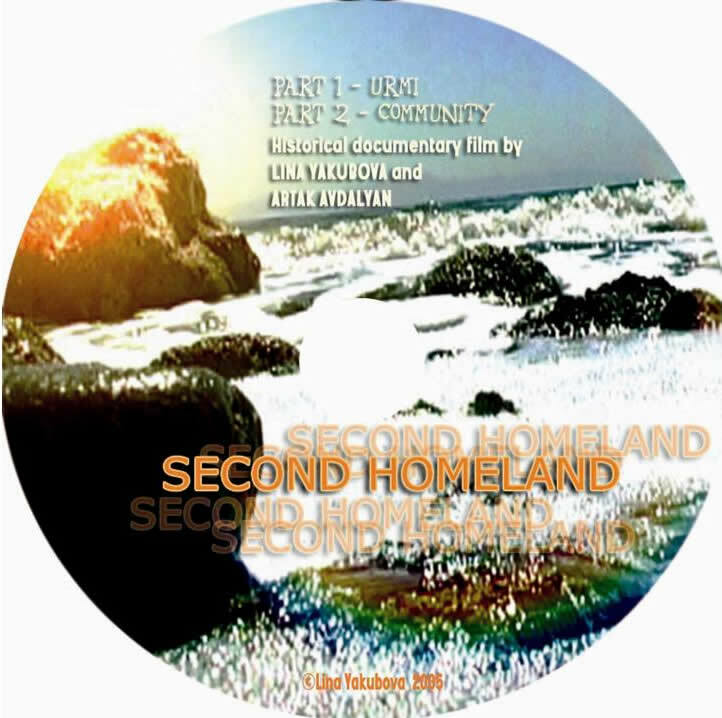 Ms. Jackie Lyden traveled to north Iraq to produce this special segment. The report explains the frustrations experienced by Assyrians who are returning to their lands and villages and how the USAID funding was improperly appropriated in North Iraq, never reaching the Christians. I invite our readers to listen to this report (see below) and view the photo gallery. I also urge you to write to NPR (Click here) and thank the producers of All Things Considered and Ms. Jackie Lyden for the timely production of this special report. "Despite Turmoil, Christians Place Faith in New Iraq"
The 3-day Assyrian General Conference concluded in Iraq on August 7th, a week before the presentation of the final draft of the Iraqi permanent constitution. The Iraqi National Assembly will begin the voting process to ratify the draft on Monday, August 15th. The full text of the official statement of the Conference appears below. The Statement calls for the establishment of an Assyrian State in the Nineveh Plains and the recognition of the Assyrian language as an official language of Iraq. The Statement also requests the use of an Assyrian symbol in the Iraqi flag. The Assyrian General Conference supports the unity of the Iraqi people and the land of Iraq. Iraq is a nation of various and numerous nationalities and religions. The Assyrian General Conference emphasizes a complete sovereignty and independence of Iraq and refuses any kind of subjection and occupation. All Iraqis are equal before the law and in the law. The Assyrians are the indigenous people of Iraq. The Twin Rivers (Mesopotamian) culture and heritage is a property of Iraq and its protection is the responsibility of everyone. The year 1921 established as the baseline for demographic changes. The Assyrian General Conference demands complete evacuation of all Assyrian villages and lands which were arbitrarily encroached and usurped, and their rebuilding and the compensation of their original owners. 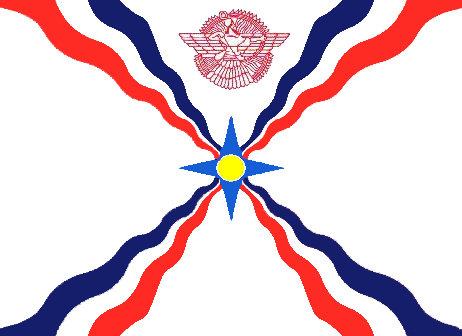 The Assyrian General Conference believes in a democratic, pluralistic and federal system, and the conference demands an Assyrian Federal State in Nineveh’s plain and in all the other historical places where our people live along with the other national constituents and sects such as Turkman, Yezidis, Arabs, Shabak and Kurds. The Assyrian General Conference emphasizes the necessity of facilitating the return of the emigrants to their homes and providing them with their needs to establish their settlement and remove all types of injustice and oppression. The Assyrian General Conference demands the international community to condemn the crimes committed against the Assyrian people by the governments that took part in those crimes, and to oblige them to offer their apologies and to compensate the victims. The Assyrian language should be one of the official languages of the State of Iraq. The Assyrian General Conference requires that the Assyrian language be taught as a national and historical language in all schools in Iraq and be regarded as an educational heritage and cultural foundation of Iraq. The Assyrian General Conference demands the inclusion of a historical Assyrian symbol in the Iraqi Flag. The Assyrian General Conference supports the separation of the State and Religion, ensuring the respect and practice of all religions in the society. The Assyrian General Conference believes in the principles of the separation between the three branches of authority (Legislative, Executive, Judicial), and emphasizes the independence of the Law. The Assyrian General Conference believes in equality between men and women in all areas. The Assyrian General Conference rejects all forms of terrorism. The Assyrian General Conference emphasizes complying with all the articles of the International Declaration of the Human Rights. The Assyrian General Conference attempts to disseminate the education of Peace, Justice and Fraternity. The Assyrian General Conference emphasizes the necessity of participation of all Iraqis sects in the process of drafting the Constitution. The Assyrian General Conference calls for the abolition of the weapons of mass destruction in the Middle East. 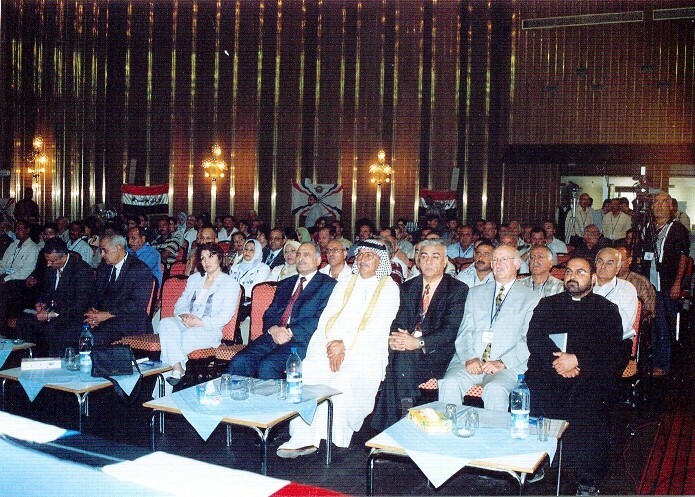 The Assyrian General Conference was held between August 5 and 7 in Iraq. Requesting from the Iraqi government to provide suitable circumstances for the Assyrians to return to their original homes in north of Iraq, especially after being targeted and exposed to organized oppression. The conference also demands dispatching letters to the Assyrian and humanitarian organizations asking them to prepare the right circumstances for the Assyrian people to possess estates in Iraq. The Assyrian General Conference encourages the Assyrian people to participate in all government, civilian and military sectors of the Iraqi society. Forming an Assyrian Economic Committee to undertake the planning and execution of an economies of the Assyrian National Effort. Forming an Independent Media Committee to promote the Assyrian cause and to request support from the central government. Consolidating the Assyrian National Effort with highly qualified and competent Assyrians who are deeply interested in the Assyrian case. This can be achieved by forming a committee which would provide study opportunities available concerning important specializations in the law, politics, economics, history etc.. Forming a committee to undertake the process of coordinating the Assyrian ballot for the upcoming election. Emphasizing and raising the women’s role in the political and educational process. Long live our beloved homeland, all the glory and immortality for the great martyrs of the Assyrian Nation. (ZNDA: Ankawa) It looks much like any other Iraqi town, until you notice the number of shops selling alcohol, the young women walking the streets at night in jeans and tight T-shirts, and the church spires. Ankawa, a town of about 15,000 people just outside the capital of the northern Kurdish region, is almost entirely populated by Christians and has become a bastion of that declining -- some say dying -- community in mainly Muslim Iraq. Legend says Ankawa was founded in the 2nd century by Saint Thomas the Apostle. It is one of the oldest Christian settlements in Iraq, a land that has deep roots for several Christian denominations, including Chaldeans and Assyrians. In the early 1990s, Iraq's Christian community was estimated at more than one million with large populations in Baghdad, Basra and the northern city of Mosul. But since 1991, and particularly over the past 2 1/2 years, the community has fallen into disarray. Christians are fearful religious violence after churches were bombed and Muslim militants targeted Christian-owned alcohol shops. Father Youssef Sabri, a priest at St Joseph's Chaldean church, maintains broad connections across the Christian community in Iraq and says the numbers may now have dwindled to 600,000 or less out of a total population of around 27 million. Far away from most of the bombs that plague the country, Ankawa has emerged as a refuge for Christians seeking to escape violence. It has also become a jumping off point for those looking to flee Iraq. Around 250 families have come to Ankawa from Baghdad, Mosul, Samarra and other towns in the past year, according to Sabri, while hundreds more have left, moving to Sweden, Australia, Canada, Britain and the United States. "People here say, 'Rather Ankawa than Baghdad'," said Father Tariq Choucha, another Chaldean priest in the town. "But what they really want is a visa to go abroad and stay there." As well as alcohol stores, Ankawa has several restaurants, an ice-cream parlour, an Internet cafe and antiques shops. There are two churches and three chapels. Because of the possibility of attack, and the presence of foreigners, security is tight but there have been no problems. "It is a good community. We even get Arabs coming to visit," said Paulus Danha, 52, who owns an alcohol shop. Business is strong thanks to demand from the security companies and international non-governmental organizations, he said. Most of those who have left are young men, leaving behind a disproportionate number of young women. But rather than weakening the community, Sabri says it has worked out well. "Now we see the young men coming back to find wives," he said, introducing a 26-year-old Iraqi now living in Stockholm and his bride-to-be, a trainee doctor from Ankawa. While anxious about Iraq's wider Christian community, Sabri, who lived in the United States for 13 years and returned to Iraq after the war in 2003, sees some reason to hope. "It's good for the young people for now if they are abroad and secure, but eventually I think they will come back," he said. "The community is strong and Ankawa is where their hearts are." Delegates from the Assyrian communities in the post-Soviet Commonwealth of Independent States (from Armenia, Georgia, Kazakhstan, Russia and Ukraine) met in the city of Rostov-on-Don in southern Russia on August 6 and 7, 2005, for a round-table discussion on how Assyrian communities in the CIS coordinate their actions to influence events in their historical motherland of Iraq. The National Assembly, or Parliament, of Iraq is debating a permanent constitution for the country. The CIS Assyrians believe stability and progress towards democratic federalism in Iraq is the main factor in providing stability for the ethnic and cultural survival of the country’s indigenous ethnic communities that speak languages of the ancient Syriac group. These communities are very closely related and they are the Assyrians, the Chaldeans and the Syriacs. If they are to continue in their historical heartland, they need an autonomy in the future federal structure of the Iraqi nation. With this in mind, the CIS Assyrians hammered out a common position on the matter and agreed on several guidelines to act on them in the nearest future. First and foremost, they demand that everybody in the global Diaspora of the Syriac-speaking people immediately abandon destructive policies that undermine the unity of the Assyrians, Chaldeans and Syriacs. These groups are a single nation that cherishes and preserves its Aramaic language, and remembers its role as the first national entity that accepted Christianity. Christianity is the most important feature of the ethnic and cultural identity of the Syriac-speaking people. To put these messages across, the participants of the round table issued a special appeal to the Syriac-speaking people – the Assyrians, the Chaldeans, the Syriacs and all others, regardless of confessional, cultural or linguistic differences. On August 7, the delegates of the round table held a prayer service in memory of the Assyrian Martyrs, who gave their lives to defend the Assyrian nation and preserve the legacy of the great Assyrian-Babylonian civilization. The round table agreed not to allow the post-Soviet sovereignties, borders and visas that separated the fraternal republics of the Soviet Union to fragment the former Soviet Assyrians as well. Despite differences these days, the post-Soviet Assyrians are determined to go on as an ethnic and cultural community. The Rostov Appeal: Full text in English appears below. A committee in the National Assembly, or Parliament, of Iraq is about to submit a draft of what should become a new permanent constitution of its country. The deadline for making proposals and moving the amendments is closing in. In the absence of constitutional clauses that ensure the ethnic and cultural survival of the indigenous Syriac-speaking people of Iraq, the Iraqi Assyrians, Chaldeans and Syriacs cannot expect a future for themselves in their homeland. 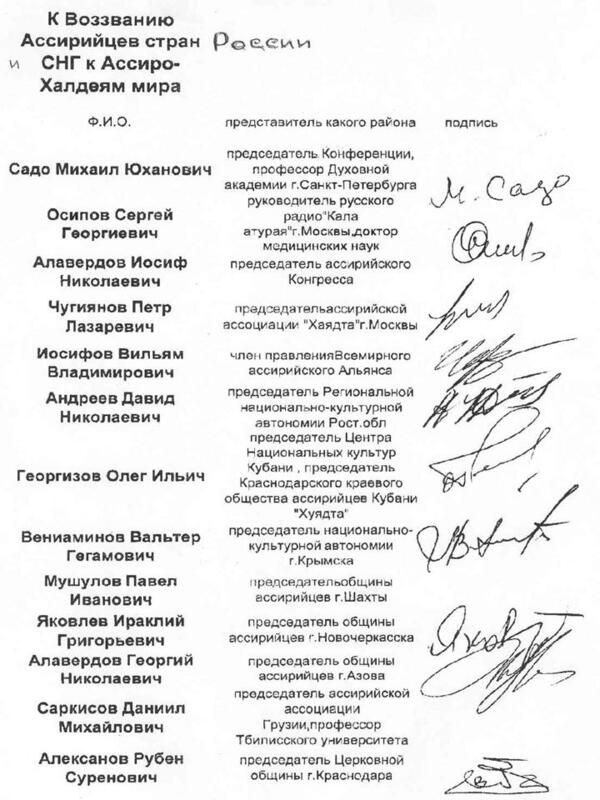 The signatories of this appeal represent the Assyrians in the Commonwealth of Independent States (CIS) (namely, in Armenia, Georgia, Kazakhstan, Russia and Ukraine). The CIS Assyrians are direct descendants of the Ancient Assyrians. The Ancient Assyrians lived in Mesopotamia, which is now Iraq. This makes Iraq the historical motherland of the modern CIS Assyrians. The future of the historical cradle of the Assyro-Babylonian civilization in Mesopotamia is part of the future of the post-Soviet Assyrians. They believe this empowers them to claim a say on the new constitution that is being drafted for the country of Iraq. Developments over the past two years or so convincingly show that the attempts to deny the Iraqi Chaldo-Assyrians' constitutional protection and rights oftentimes condition on policies by certain organizations and groups that claim to represent Syriac-speaking people. It particularly applies to the three main Churches of the Assyro-Syro-Chaldeans. After two millennia in which they played the leading role in preserving the ethnic identity and culture of their peoples, these Churches now oppose autonomy for the Chaldo-Assyrians within a federal and democratic Iraq. They fear that an autonomous Chaldo-Assyrian entity in Iraq would spell an end to their secular authority over their peoples, which they have wielded for nearly two millennia together with religious authority. Importantly, it is this secular power that led the originally single Eastern Church to split into many. The split then filtered down to the people, resulting in separate confessional and ethnic groups. The emergence of an autonomous Chaldo-Assyrian administrative entity in Iraq would dramatically reverse this split in the direction of the renewed unity of the Chaldo-Assyrians, with the confessional divisions put aside. This means that opposing any such entity amounts to direct treason against the Syriac-speaking people. With this in mind, the Assyrians of the Commonwealth of Independent States respectfully appeal to the hierarchs of the Chaldean Catholic Church, the Assyrian Church of the East and the Syriac Orthodox Church not to create barriers to the movement among their flocks towards national unity based on an autonomous Chaldo-Assyrian administrative entity in Iraq. Moreover, the CIS Assyrians ask the High Hierarchs to use their great influence and do all in their power to support this movement and extend a helping hand to all Chaldo-Assyrian political, communal and cultural organizations behind it. They also call on all Chaldo-Assyrian political, religious, regional, cultural and communal factions to expediently end recrimination, squabbling and rivalry in their midst and work as one towards the great goal of national unity of the Chaldo-Assyrians. The time is precarious, and any hope of riding it out towards prosperity and success supposes cross-spectrum respect and accord. The world is in flux, and the Syriac-speaking people cannot hope to retain their identity in it unless they have an autonomous Chaldo-Assyrian administrative entity in their historical motherland of Iraq. Reports about the current situation in Iraq contain evidence of mounting pressure on the communities of Christians in that country. Many Armenian and Chaldo-Assyrian churches there are in ruins after being bombed. Christians continue to die in unending terror attacks, targeted for the mere fact that they are of the same faith with most of the American-led coalition forces in Iraq. Being indigenous to Mesopotamia and living in an avowed democracy does not save Assyrians from suffering unfair discrimination in their historical heartland. They are particularly hard hit in the north, losing land, towns and villages to onslaught by Kurds. In the two years since the fall of Saddam Hussein, over 80 thousand Assyrians have fled the country and joined the worldwide Chaldo-Assyrian Diaspora. Over the past two centuries or so, Russia’s Cossacks have developed brotherhood-in-arms and vast cooperation in culture with the Assyrians. On the Caucasus Front of the First World War, they took on Turks and Kurds with help from Assyrian battalions of prominent military leaders like General Aga Putrus, General David d’Bet Mar-Shimmun, Malik Hoshab and Malik Ismail. After the imperial collapse, the Cossack forces of the legendary military leader General N.N.Baratov defied orders by the Provisional Government of Alexander Kerensky for the Caucasus Front to disband and continued to honor their military oaths to the Emperor and their obligations as military allies of the Entente Powers in the West. Joined by Assyrians and Armenians, they held out against hostile forces around and rode out the rigors of a difficult trek from Urmia in West Azerbaijan to Hamadan southwest of Tehran and then to holding camps in Baquba near Baghdad. In 1918, the Cossacks saved tens of thousands of their Assyrian brothers and sisters in Christ from certain death at the hands of Iranians and Turks during an Assyrian exodus from Turkey and Iran. Today, the Russian Cossacks are again seriously worried about the situation of the Assyrians in the historical heartland of the Assyrian people. They assure their Assyrian brothers and sisters of unlimited support and readiness to come to their rescue. The Cossacks are prepared to do whatever is necessary to protect the Assyrians in their historical heartland and save the millennia-deep heritage of the Assyrian nation. After the re-establishment of the Assyrian Chaldean Syriac Student Union (ACSSU) as a representative body of our students in Canada, and strengthening its branches in numerous Canadian universities, we decided that it was time to give back to our cultural community once again. An initial agenda for the Genocide Awareness Day was set and all of our organizations within Ontario were invited for an introductory meeting at the Assyrian Society of Canada. Primarily we had two objectives to share with the organizations present. First and foremost we were keen on reaching out to all of our people, regardless of their church denominations (Assyrian Church of the East, Chaldean, or Syriac…etc). We knew that the spirits of our sacred martyrs would guide us through the path of unity. Secondly we believed it was important to give our females an equal chance and representation in this year’s memorial. Discussions regarding our first objective received significant value, and the importance of our unity was stressed by all organizations involved. Numerous organizations, including ACSSU shared their difficulty in gaining members from other church denominations (Chaldean and Syriac) and expressed their concerns of our possible shortcomings, and steps needed in strengthening our ties. Although we are extremely proud of our Assyrian name and our glorious history, we have come to the realization that through the millenniums and for various factors we have adopted different names. Consequently, the organizing committees collectively agreed on using an inclusive title in hopes of building bridges between our various communities. 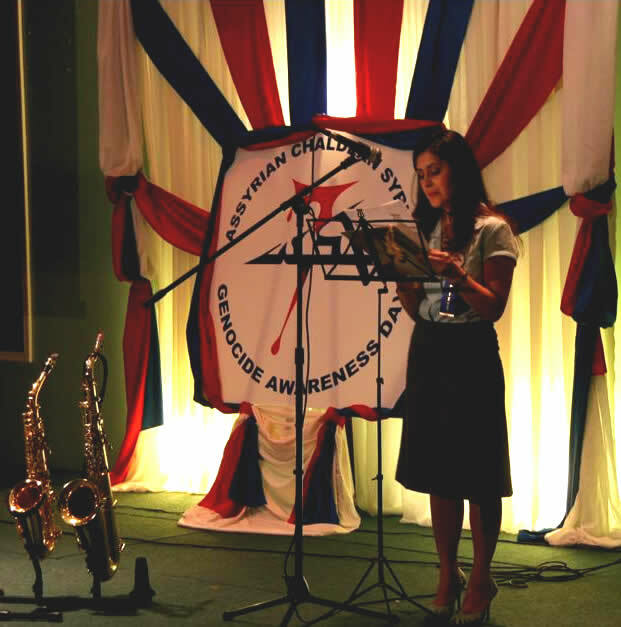 Hence, the chosen name for this year’ event was The Assyrian Chaldean Syriac Genocide Awareness Day. Following the preliminary meeting, regular gatherings, as often as three times a week were held to prepare and organize for our Martyrs Day. We were eager on providing our community members with a creative, innovative and informative program. We also wanted to present our people with some actual, first hand accounts of genocide survivors, although knowing that this was a difficult task to accomplish. We were pleasantly surprised on two accounts. At the outset, our dear friend and ACSSU member Sargon David presented us with a precious poem written by his great grandmother Nanasih Abraham, a genocide survivor from the Village of Gulpashan, Iran. Nanasih Abraham vividly described her harsh experiences in 1918 as she witness the destruction of her beloved village, the murder of her father and relatives, and the brutality our innocent people were subjected to. Secondly, upon meeting Rabbi Hormiz Aboona, a historian and well know and accomplished writer, to personally invite him as our guest speaker, he informed us that his chosen topic was the role of our female in society historically and more specifically during the genocide. Our spirits were uplifted, our second objective was firmly set into place and as we will see our primary objective was already in the making. Along side advertising in our community and inviting our numerous church leaders, we realized the importance of inviting Canadian Media sources and Politicians; therefore, 24 different letters of invitations and pamphlets were sent out. On August 7th 2005, we pleasantly welcomed a crowd of over 200 people, amongst them was Father Diyadoros Mokhatas (Priest of the Ancient Church of the East), and Rev. Rabban Stephnos Issa (Priest of the Syriac Orthodox Church). Two Canadian media sources, The Toronto Star, and Mississauga news, and our own Ashur T.V., and Akkad Media were amongst the broadcasters. The evening began with a prayer and a speech, first by Father Diyadoros Mokhatas and then by Rev. Rabban Stephnos Issa. Father Diyadoros expressed his joy in seeing students organizing for such events, and reminded us that our youth are the supporting pillars of our nation. He further stressed that history seems to repeat itself and as a result our nation is repeatedly persecuted; therefore, he suggested that we should strengthen and guard ourselves with hope, love and UNITY, regardless of our church denominations, or political affiliations. Rabban Stephnos had a similar message of hope and unity, and began conversing in our Western Syriac dialect. Numerous parts of his motivational speech will be provided as translated from the Arabic Language that he continued with. He passionately stated that in his blood boils the love of our people, although years and centuries have divided us, mainly due to our arrogance. Why are the Assyrians Chaldeans Syriacs and Maronites, people who have the same roots and origins far away from each other in terms of faith? My shame in this is great, he stated, and we carry this shame because we are responsible for it. He ardently stressed that our pride has divided us. We are one Nation, the Euphrates river that divides us also unites us; our language with its Western and Eastern Dialects are the same; if you look into our faces, he continued, you will not be able to distinguish between an Assyrian, Chaldean, nor a Syriac individual; if you observe our traditions, our passion, our love, our humbleness, our enthusiasm, and our advancements they are all the same. Foreigners, along with our own weakness, and lack of faith have contributed to our division as a nation. Foreigners are also to be blamed for exerting different names and labels upon us. It is about time that we come back to each other and search for our identity, and believes, he stressed. Mr. Ramin Benyamen, presenting the Semel Massacres. Ramin is the son of the late Martyr Youbert Benyamen who was executed by the former Baath regime in Iraq on 2 March 1985. Regarding the theology of the Assyrian Church of the East and the Syriac Orthodox Church he mentioned the similarities, specifically in terms of Christ’s nature, and proceeded with a strong quote in English “We both believe the same thing, then why do we accuse one another?”, “It is because we ignore one another, and we are not humble enough to come and greet one another and understand one another and meet and embrace one another”. He continued stating that our differences are insignificant. More importantly he mentioned that we are proud that our numbers in heaven exceed those present on Earth, and if we were to look upon the heavens we would be sure to find our people, Assyrian,Chaldean,Syriac and Maronite all united around Christ. That is what we would like to see here on Earth. Glory and unity and God’s blessing to all of our people. This motivational speech was followed by a Minute of Silence along with a Saxophone performance by Johnson Aghajan, to honour our beloved martyrs. A table was set near the stage, with a large candle representing the ever lasting hope of our nation that was surrounded by smaller candles. Every speaker was asked to light a candle from the candle of hope in recognition of raising awareness and continuing the hope of our Nation. It should also be mentioned that our musicians and singers devoted their time, free of charge for this national day. Singer Roubina Shmouel beautifully sang “Shlama”, and prominent singers James Odisho, and Ramiz Bet Shmouel joined together for the concluding song Roosh Jwanqa “Awake Ye, the Youth!”. Ms. Alda Benjamen, author of this article, presents "the Ethnic Cleansing by the Ba’ath Regime and the Anfal". A courageous 16 year old, Ramsina Hormiz along with her father deacon Pankhas Qashisha Hormiz, joined us from Sweden and dedicated a poem in the honour of our Sahdeh (Martyrs). Majid Aziz from Akkad Media also recited a poem entitled “ChaldoAshour, and al-watan (the homeland)”. Our audience was overwhelmed with emotions as Sargon David traced his great grandmother’s horrific journey that initiated in her beloved Gulpashan. This poem was divided into three segments and brought to life with the presentation of her scanned hand written original poem. May Isaac, the wife of Martyr Youbert Benyamen gave a personal account of her experiences before and after the execution of her husband, a member of the Assyrian Democratic Movement in February 3rd 1985, for promoting our national ideals. 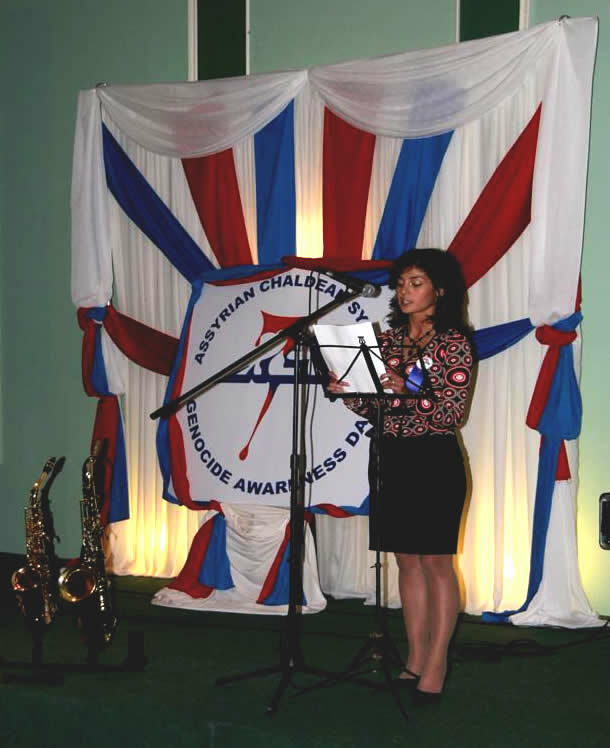 Ms. Ashorina Shimoun discusses the current situation of the Assyrians. In the background the image of an Assyrian mother and child, victims of the church bombings in Iraq, is projected. This presentation, as the name implies, was put together to raise awareness of the atrocities committed against our brothers and sisters whose only crime was being an ethnic minority. We remember the 750,000 who died in the background of World War 1 in Iran and Turkey in what is now known as Sayfo, or the Year of the Sword. We remember the 3,000 who were massacred by the Iraqi army in the village of Simele in 1933. We remember those who died during the Anfal Campaign executed by the Iraqi government in the 1980s as a means of ethnically cleansing the northern regions of Iraq. We remember those that very recently lost their lives in Iraq and those who are forced to leave their homelands in search of refuge. It is the responsibility of the current generation of our people to bring justice to those who have perished for our sake. True justice will be accomplished when our persecutors acknowledge their offences. For this reason we ask that Turkey recognize our genocide and apologize for the crimes committed against humanity during World War I. We ask that Turkey compensate our people for the damages brought onto them, including loss of land and property. We also ask Turkey to grant our people living within its boundaries full national and political rights. For our people currently living in Iraq we must take every measure possible to prevent genocides like the ones that nearly wiped out our nation from ever occurring again. To assure this, we ask that our people be granted, in the new democratic constitution of Iraq, an administrative region in northern Iraq where they can live in relative safety and be able to continue their unique cultural and national heritage. We oblige the international community and all humanitarian organizations to recognize our genocide and to prevent atrocities like this from occurring by promoting security and equality for all minority groups. We also oblige them to enforce our rights as the indigenous people. It is only through these actions that our people, language, culture, and national identity can continue to survive the future. Despite the best efforts of our oppressors our identity continues to thrive in the world. Our light of hope burns bright in the efforts of our people all around the world. Yet there still remains a great deal left undone. In order to emerge as unified successful peoples we must set aside our minute differences and truly come together in the name of our Nationhood. First impressions: On a fast-moving stretch of Dempster Street in Skokie that's dotted with ethnic restaurants, it's easy to miss Larsa's--or so we'd like to think since we did and had to double back. Jammed into the kind of business strip with one car lane feeding off the main street, the exterior is not much to look at. Inside, this Assyrian family restaurant is calming with white walls, tile floors, white tablecloth-topped (then plastic-protected) tables, brass lighting fixtures, all dominated by a mural of an ancient Assyrian feast. On the plate: The Middle Eastern big three of hummus, tabbouleh and baba ghanoush tops the appetizer list confidently. The menu trucks along through familiar territory: grape leaves, manna eash (pita topped with sesame seeds, olive oil and spices, similar to zahtar bread), falafel and, among entrees, kibbee, shawirma and several types of kebabs. Homemade lentil soup with rice that's flavored with curry and dill comes with all entrees. Some of those entrees also are served with a house-made stew--the flavors of which change from day to day, but include a tomato-based version, one with okra and another with white beans--for pouring over your rice. The pita bread that is used for sandwiches (laffah) and served with appetizers is made on-site; it's served burn-your-fingers hot. At your service: Welcoming and accommodating best describe the servers. During one visit, our playful server suggested "you can get your fingers dirty--it's Cornish," when she spied one of us laboriously cutting up the Cornish. Second helpings: The Cornish hen--eaten with fingers or not--was a whole hen, split down the back, charbroiled and served open on a bed of tender basmati rice. Flavored with citrus, the skin was crisp, the meat tender. Hummus, tabbouleh and baba ghanoush were all winners. The creamy hummus was rich with tahini and topped with olive oil plus three chickpeas. The tabbouleh tasted like it had been made just that instant; refreshing with parsley, not too much cracked wheat and just the right bright hint of lemon. The baba ghanoush was very smoky (too smoky for some tasters, though I loved it). The kifta kebab pita featured ground chuck, onions, parsley and spices formed into a log, skewered then roasted, creating a satisfying sandwich of complex flavors. The falafel platter featured four balls (crisp outside with a moist, tender and heady interior) and a lettuce-and-tomato salad served with a smooth, garlic-spiked tahini dressing. It's a small portion compared to the other oversized entrees, but good to share or combine with a couple appetizers. The chicken kebab yielded the most succulent bird we've tried in a long time, tasting of a citrusy marinade. Take a pass: The Mediterranean salad of cucumbers, tomatoes and onions was bathed in a delicious dressing spiked with herbs, but until better summer tomatoes are available, we'd order the jajeek (a tangy yogurt and cucumber salad) instead. Extras: Noteworthy among beverages is the shanina, a blend of yogurt and water that is light in texture, tangy and a bit salty. It complements the food very well, especially the kifta kebab and beef shawirma. BYOB. Prices: Appetizers, $1.95-$4.95; salad and sandwiches, $1.75-$4.95; main courses, $5.95-$10.95; side dishes, 75 cents-$1.50; desserts, $1.75-$2.50; drinks, $1-$1.75. Reviews are based on anonymous visits by Tribune staff members; meals are paid for by the Chicago Tribune. 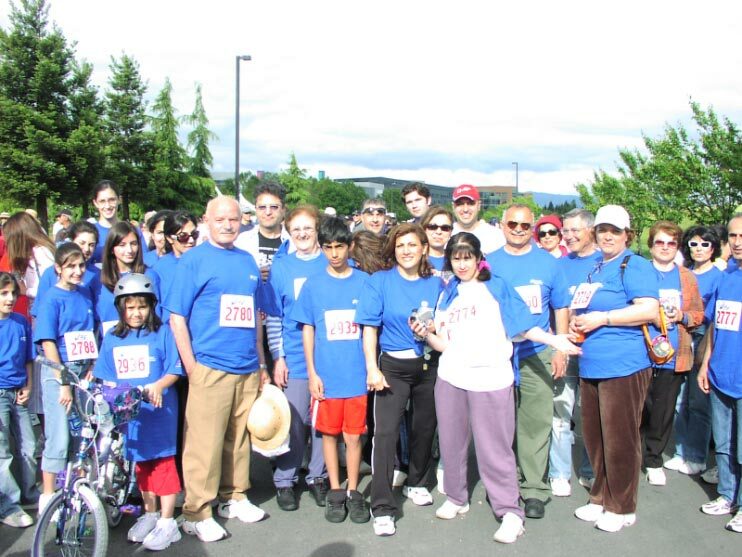 Thanks to all of you, Human Race Walkathon 2005 was a smashing success! We had the highest number of participants this year; over 150 people registered for the 5K walk. Through your generous contributions and the matching funds from National Semiconductor, we raised a total of $17,570. Out of this amount $14,755 went to the Assyrian Aid Society of America and the rest went to Silicon Valley Volunteer Center to be given to the local charities in Santa Clara Valley. The money raised will be used by the Assyrian Aid Society of Iraq to purchase generators and other equipment necessary to provide electricity and lighting to the villages of Dehe and Margajia in our Homeland. Our deepest gratitude to all of you who supported us either by donating money or participating in the 5K walk. We very much appreciate your generous support. Let's do it again next year. The Assyrian Aid Society of America () is a tax exempt, non-profit 501(c)(3) organization . Federal ID # 94-3147517 . All contributions are tax deductible. The Will to Survive as a Cultural Entity…Middle Easterners Find Shelter in the U.S.
Boston, MA—Today, fully half of the world’s last Aramaic speaking population lives in Diaspora, the majority residing here in the United States. 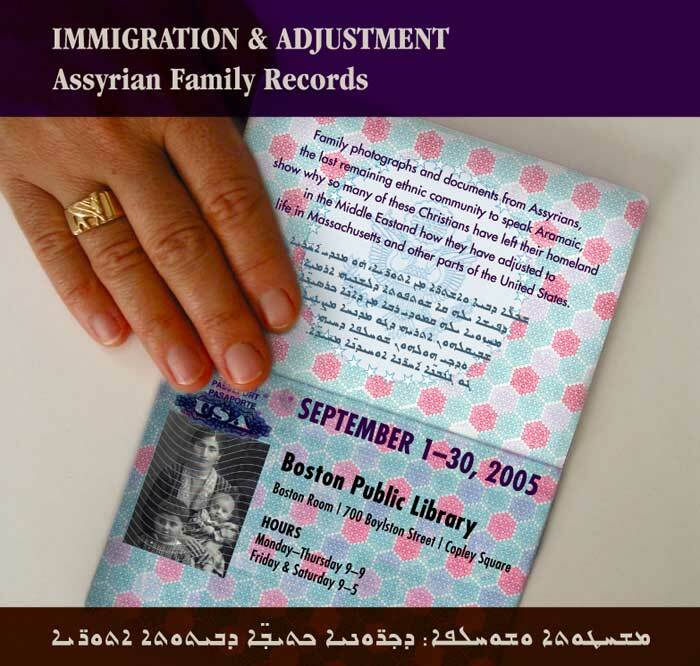 Featuring photographs and first person accounts dating back to the early 20th century, an exhibit at the Boston Public Library, “Immigration and Adjustment: Assyrian Family Records”, will give historical context to an immigration story that is both familiar and unique. Drawing on carefully selected photographs, documents, and oral histories of six families, the exhibit is the first public project in the United States to study the history of Assyrian departure from their Middle East homes and villages for new communities in the United States. The complementary group of families left the Middle East region starting nearly a century ago up through the Iranian revolution. Focus falls also on the precarious situation of this community in Iraq today. Docents will lead tours of the exhibit on September 1 – 3 and on the last three Saturdays in September prior to the related lectures. 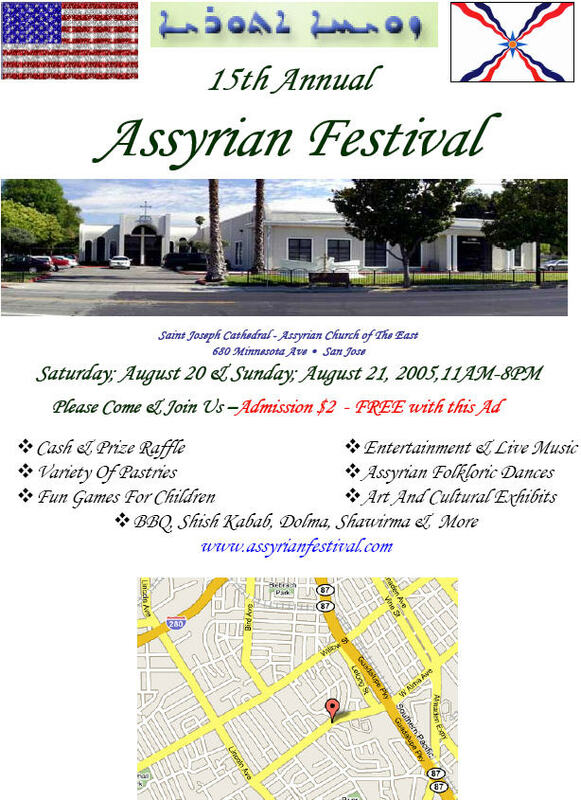 The exhibit opens in conjunction with the annual Assyrian American National Federation Convention meeting in Boston (Sept. 1 – 5, 2005). Three related lectures will be held at the Boston Public Library on consecutive Saturdays in September. The lectures are open to the general public. This program is funded in part by the Massachusetts Foundation for the Humanities, with in-kind support from Boston Public Library, and generous funding by the Assyrian American community. Select images from the exhibit are attached in 72 dpi. Online press kit is also available. Please contact Dr. Eden Naby for more information. September 1 – 30, 2005, Immigration and Adjustment: Assyrian Family Records, exhibit of photographs and histories of six families, documents the journey from the Middle East to the United States, from the early 20th C to the 1980s. Boston Public Library, Boston Room. 700 Boylston Street, Boston MA. Open to the public during library hours (M–Th, 9–9; F–Sa, 9–5). September 1 – 3, 2005, Immigration and Adjustment: Assyrian Family Records, docent tours available for exhibit of photographs and histories of six families documenting the journey from the Middle East to the United States, from the early 20th C to the 1980s. Exhibit will be on display through the month o September. Boston Public Library, Boston Room. 700 Boylston Street, Boston MA. Open to the public during library hours (M–Th, 9–9; F–Sa, 9–5). September 10, 17, 24, 2005, Lectures in Conjunction with Immigration and Adjustment: Assyrian Family Records, an exhibit of photographs and histories of six families documenting the journey from the Middle East to the United States, from the early 20th C to the 1980s. Conference Room 5 (BPL Johnson Building – 700 Boylston) 2-4 pm. Handicapped accessible. For the last seventeen centuries we have been considered no longer a Nation but a Religious Community, with no National aspirations and a meaningless existence. Let the true Nationalists Reformers of our beloved Nation turn the tables, and free our Nation from the heavy yoke of our Greedy Religious Leaders and their influence. For once let us live in dignity as a Nation where we shall be respected along with the Arabs, Kurds, Turkmen's, and others in Iraq, and not to be considered a bare Christian minority were we will be given the status of "Ahel AI Dhimma" or third class citizens in our own Ancestral homeland. 2. Constitutional recognition of the Assyrian national rights in Iraq. The latest speeches by Mar Dinkha and Mar Aprim are typical examples to confirm this tendency. But, let me ask the reader, were all the prelates of our church present in Australia when this letter were decided upon? Furthermore, were all of them consulted? The answer to both questions is a sure NO. Let me further ask, isn’t this letter from the Assyrian Church Synod openly and clearly splitting our nation by marginalising the Chaldeans and the Suryanies. Isn’t this letter misleading and dirty politics? And yet our church leaders continuously deny that they interfere in our national politics. Can't you see my brothers and sisters that our historic and institutional Churches Instead of preaching unity and reconciliation our church leaders are seeking the separation of our ChaldoAssyrian Nation with the help of some faked nationalists of today. These church leaders have been splitting our Nation for the past seventeen centuries. Along with other foreign religious fundamentalist, they have been the real cause for the annihilation of 50 million Christians that were killed because of such selfish aims. It is not surprising to notice that they have acted even more negatively after the removal of Saddam. The Assyrian Church of the East leaders bear the biggest burden from all the rest, by marginalising all the other Churches, such as the Suryaniyeen Churches whether Catholic or Orthodox, and the Chaldeans Church. They dare to consider the adherents of the Presbyterian churches null and void. Quite a few of our great writers and nationalists belong to Protestant, Orthodox and Catholic churches. But, unfortunately, our Assyrian church don’t recognize these facts. Mar Addai from the old Calendar of the Nestorian Church (B) whose Church split from the main Nestorian Church (A) In the 1960s went along with Mar Gewargis of Church (A) in recommending Mr. Gewargis Bacous as their preferential candidate in the government against Mr. Yonadam Kanna's choice. Indirectly weakening the position of Mr.Yonadam Kanna in the Iraqi government, because he was getting out of their control and becoming a very popular political figure for all Christians in Iraq. Can’t you see that the only time the rival churches agree on something is when they desperately need to crush a true Nationalist? They do so, because they always have assumed that a true nationalist is a threat to their establishment. Once this is accomplished, they are back at each other’s throat. My dear brothers and sisters stick with our unified national name ChaldoAssyrians, or for that matter with any other name that ultimately will bring together the unity of our nation for the time being. Let our future generations decide on any changes they might deem fit. Let us break away from the corrupt influence of our Church leaders and follow our true National aspirations, for once. Let us not loose this Historic Golden opportunity in Iraq. If we miss this coming election like the one in January 2005 we are going to be the biggest losers among all Iraqis. The article linked below, due to its extensive content, was not edited and published in Zinda Magazine. Please click the link below to read the article from within an external website. No parts of this article were reviewed and edited by Zinda Magazine or formatted by Zinda technical crew. The views expressed in the other website do not necessarily represent those of Zinda editors and staff. No material published outside of Zinda Magazine is copyrighted by Zinda and no legal action can be taken against Zinda Magazine should the content be changed in the future. I need to make one more point here, Assyrian religious leaders have the tendency to twist words of people like myself. They take what we say against them and their weak action and bend our statements claiming that we are speaking against our Lord and Saviour Jesus Christ and against our beloved Christian faith. Well, my fellow Assyrians, I am not here criticizing Christianity, the Bible or the ideals for which the Kingdom of God stands for. 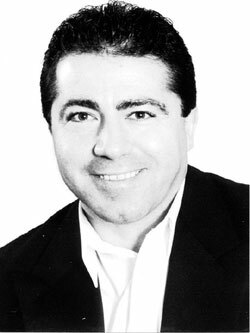 Please understand me when I say it is the ill intention of the majority of our church leaders as exemplified by today’s Assyrian Church leadership that I wish to criticize and expose and clearly say that it is they, not us, the nationalists, that ARE against Christ, due to their selfishness and utter corruption. In fact, I consider myself a person of a stronger faith in God than they are. Now, back to my previous point. Give your full support for the unified slate and don't listen to the fundamentalists and the ultra nationalists of the Assyrians, Chaldeans or Suryaniyeens. They are the puppets of either their Religious leaders or the KDP or simply working for their own personal gains and fame. They never had any regrets and never will, for being the cause of splitting our one nation. We should support only the religious leaders who truly and faithfully support the unity of our one nation, as Christ has commanded all believers to be like him bringing peoples and nations close to one another and ultimately to God. I consider myself a good Christian but I am really disappointed with our Church leaders that have NOT carried truly the message of love and unity of our Lord JESUS CHRIST who plainly told his disciples to be united as he and his father are one. You can clearly see that our church leaders expect all our political organizations whether Assyrians, Chaldeans, and Suryaniyeens to take instructions or guidance from them so much that our parties political declarations must go along the mentality of the Church leaders policies otherwise, our political parties will be doomed and considered outcasts by their community, because we are still considered a priestly nation and rightly so. The Jewish reformers assembled in Pittsburgh, Pennsylvania in 1885 made a statement that they considered themselves "No more a Nation but a Religious community." Similar declarations had already been made in Germany, France, Holland, and Poland. Once the Jewish reformers bluntly admitted for the first time in twenty centuries that they were a Religious Community, they immediately woke up and started planning and envisioning the establishment of the “Mighty State of Israel " which was created in spite of their internal conflicts or external enemies. The Jewish Nationalists Reformers solved the problem of the Compound name and agreed among themselves that Israel shall be the Nations name, Jews shall be called the citizens of this new Israel Nation and Hebrew shall be the official language of the Nation. Once this was agreed upon, the Jews from Diaspora poured back to Israel from all over the world with their different ideologies and beliefs united under the triune of this political agreement among themselves. The Chaldeans, the Assyrians, the Suryaniyeens, the Arameyeens, and the Maronites once they rid themselves from the influence of their Religious leaders, miracles can be achieved in starting to set this New Nation on a new path of renewal and prosperity. My dear brothers and sisters from Bet Nahrain go for it and grab this opportunity, don't hesitate for a minute for this is your right. We are desperately in need of a homeland that we can call " Our Sweet Home". This can only be accomplished once we are able to separate our political affairs from our religion and religious leaders. All of us as Christians prefer to have a secular state in Iraq, simply because all the citizens of Iraq are going to be equal under the law of a secular Iraqi State, even though each citizen may belong to a different faith. But when it comes to forming the foundations of our own Nation we are against secularism simply because each one of our Institutional churches wants to have the final say and to marginalise the rest. Aren't we very similar in our thinking and attitudes to the fundamentalists of the Sunni Wahabi sect? And yet we condemn them. Aren’t we the world’s greatest hypocrites? Mr. Yonadam Kanna is not a fanatic Assyrian and is willing to create a realistic nation in unifying all our different names that have been used and existed in our nation for centuries, with no one left out or marginalised. I have come to know this individual for his foresight in accepting the fact that we are all from the same roots of Bet Nahrain. Why can’t we unite under a compound or any other acceptable name that pleases all the segments of our nation? He obviously realizes that if we go each under a separate name we will loose our credibility among the Arabs, Kurds, Turkmans, and the Allied Coalition which freed us from Saddam. He realizes also that our numbers in Iraq works against us. If we, the Chaldeans, Assyrians and the Suryaniyeens come together, we could be talking about approx. one million people in Iraq, which roughly speaking is 4% of the total population. He also realized that since we stem from different religious communities, without hesitation he approached the leaders of our powerful institutional Churches. The results from these meetings were quite fruitful in the early stages. The Assyrian Prelates didn't have any objections whatsoever, that we were all brothers in Jesus Christ, same goes for Mar Emanuel Delli, where he personally attended interviews on AI Jazeera station and others along with Mr. Younadam Kanna. Mar Zakkai of the Suryaniyeens gave his blessings and support on a carte blanche basis for his representatives to go along with Mr. Younadam Kanna of ADM under the ChaldoAssyrian Compound Name. The Assyrian Church leaders did not oppose it. But, later on, they all got scared and realized that the unification of our Nation was going to be catastrophic to their positions and self-serving interest. (this is where they always have been wrong, for the past seventeen centuries). So they began to play their old tricks of dividing our people and ruling them. This policy nowadays is only practiced by a few Dictators such as Saddam and some other corrupted leaders, but their time has been running out. Our Church leaders knew the mentality and the weaknesses of their national political parties and their stooges, so they turned these parties against this new compounded name of ChaldoAssyrian. Later on, one by one, they openly retracted their support for this compounded name of ChaldoAssyrian. Dr. Emanuel Kamber the newly elected General Secretary of the AUA whom I had the pleasure and the privilege of working with him in the AUA “B". We both served a couple of years in the project of renovating the Assyrian Society of Great Britain in the 1980s. We both joined AUA “B“ because we did not agree with the dictatorship of the AUA “A” and their methods of appointing their delegates world wide, since it was based purely on the individual’s financial status. Dr. Kamber used to be a staunch supporter of Zowaa. In fact in our AUA congress which was held in London in 1982, he insisted that AUA “B“ in its declaration must mention clearly that it supports Zowaa morally, politically and financially. Unanimously this notion was agreed upon and adopted. This was the strongest AUA declaration ever written openly supporting the Assyrian Democratic Movement (Zowaa) in Bet Nahrain. Remember folks, this was during the days when Mr. WMD (Saddam) was very powerful and ruling Iraq. Regrettably It has been noticed lately that Dr. Emanuel Kamber has changed dramatically and that now he is clearly working along the lines of the Assyrian Church of the East mentality and those of Dr. Sargon’s policies. He is clearly against the ChaldoAssyrian unity. This will be recorded in our Nations historical archives, that the two main Ph.D. holders have made their sole objective to split our nation with their stubbornness in sticking with the “Assyrian only” name, knowingly clearly that they are fulfilling the plan and adhering to the directives of the Assyrian Church of the East leaders, and therefore, automatically those of the KDP. All the AUA’s executive committee and most of its members with the exception of a few that were elected are completely against the ChaldoAssyrian Unity. Openly the newly elected executive secretary Ms. Mary Younan from the AUA branch of Canada, sitting in the hotels lounge along with Mr. Yatron Darmoo the representative of Dr. Sargon, and Andy Darmo, the Chairman of the Assyrian church in U.K. were openly and loudly attacking Zowaa and Mr. Yonadam Kanna personally. This is another example of the AUA and the Assyrian church representatives attitude towards the unification and the reconciliation, in uniting our political parties in Iraq. 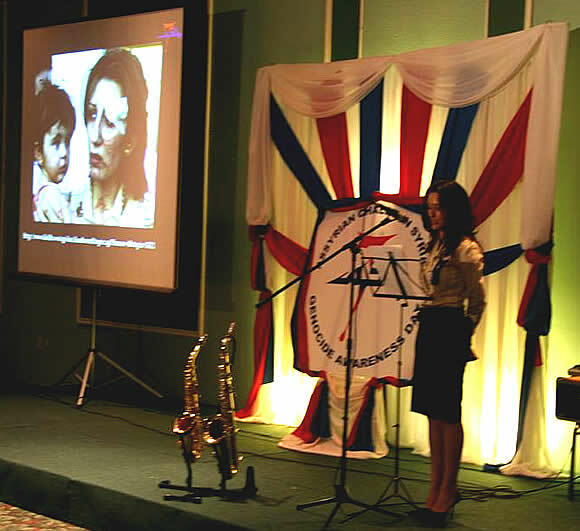 AUA is the oldest Assyrian Political Organization and supposedly the mother of all Umbrellas, which was created 37 years ago in Pau, France, at the house of our Great General Agha Petros’s son Dimitri, whose father had used officially the Compounded name of AssyroChaldean to unite our nation after the turn of the 20th century. As usual the Nestorian Patriarchal family presently ”Assyrian Church of the East” were deadly against this name, in particular Surma Khanim. The results were disastrous. The AUA’s Shaftless Umbrella was supposedly to unite the Chaldeans, Assyrian, Suryaniyeen, Arameyeen, Moraniyeen, etc. Unfortunately the AUA’s pathetic and shameful declaration of 23 points did not once mention the name of the Chaldeans, Suryaniyeens, or any other segment of our people. 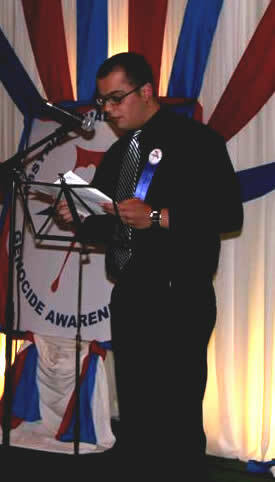 In the opening gathering of the AUA Congress held in the Assyrian Society of Great Britain in London on the 7th of July 2005 their, ex-General Secretary Senator John Nimrod in his opening remarks said, that before coming to London for the Congress he had informed the Assyrian American Federation and his Holiness Mar Dinkha of the Assyrian Church. In other words, the AUA clearly and undoubtedly is the mouth piece of the Assyrian Church working together in splitting our nation. I was amazed by the majority of the AUA delegates and attendees, they were still living in the 1968 mentality, most of the founders of AUA in 1968 were in their thirties and now they are in their late sixties, they have not reformed one bit, and they are not ready to reform. The point serves as an open hypocrisy and a real dictatorship which, ultimately shall DIVIDE our Nation, while had they used the ChaldoAssyrian term, they would have most definitively UNITED our NATION. Let us compare the true Suryanis Nationalist party “ADO” statement of the 3rd of July 2005 in supporting the ChaldoAssyrians with that which was sent by Dr. Kamber on 3rd August 2005 to the Chairman of the constitutional committee in Iraq. In the 2nd paragraph Dr. Kamber is stating that Assyrians of Iraq are between 1,000,000 to 1,250,000 million people. These figures can only be correct when Dr. Kamber along with his powerful and influential religious leaders admit for once (whether they like it or not) that the people of these figure consists of Chaldeans Catholics, Assyrian “Nestorians” and Syryanis Catholics and Orthodox. If Dr. Kamber is talking purely about the people who call themselves Assyrians in Iraq, then he should adjust his figures to a number that is well under 100,000, namely, less that 10% of what he is projecting. In the 3rd paragraph of the same letter Dr. Kamber is stating that the Assyrians were not recognised before or during TAL, and so he is stressing that the Assyrians should be recognised. In other words he is clearly stating that the AUA does not recognize the ChaldoAssyrian name that was inserted and chaired by a Gabbara of our ChaldoAsyrian nation called Mr. Younadam Kanna from ADM “ZOWAA”, the party that Dr. Kamber strongly supported some twenty years ago. Things must have changed in the last ten years with the new developments in the northern part of Iraq. I was also shocked to see that somebody like Mr. Younathan Bet-Kolia from the Iranian AUA chapter who is an MP in the Iranian government, representing Assyrians and Chaldeans of Iran not objecting to this AUA’s pathetic declaration of not mentioning the Chaldean name not even once. I think the Chaldean Iranian community should have a serious talk with Mr. Bet Kolia. 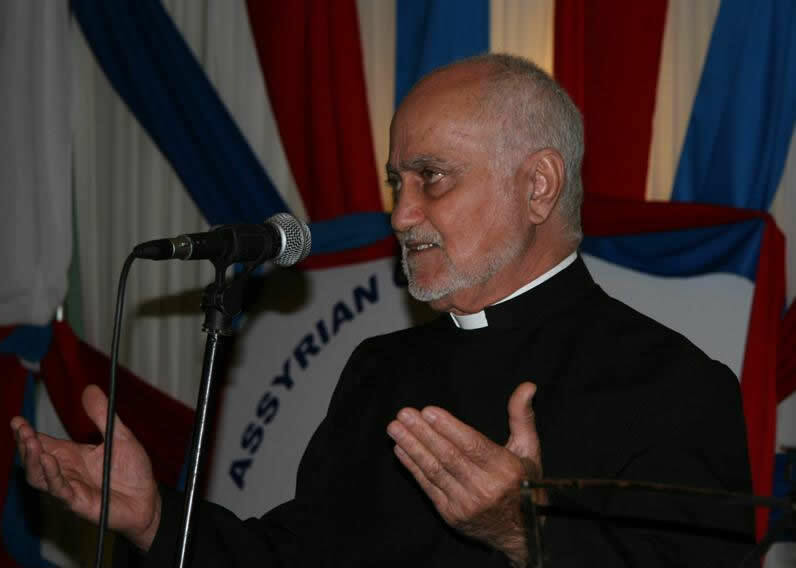 I was not surprised by Mr. Praydon Darmoo’s position which was consistent with his previous stances since he as a “Qayyouma Pateriarkaya” of Mar Dinkha was the one who attacked the policies of the AUA “B”, namely, the political arm when it was getting out of control of the Assyrian church leadership, exactly the same situation with today’s ZOWAA. Bravo to all our institutional church leaders and their Puppets for serving the KDP policies, which are clearly to divide our Nation during this constitutional battle and the next elections into at least three separate groups of Chaldeans, Assyrians, Suryanees, and possibly others. Stick to your National Unrealistic Dreams and Songs for the next 25 centuries. Most probably now we will go down in the constitution as merely CHRISTIANS divided into Chaldeans, Assyrians, Syryani. Etc. which by implication will become only religious denomination rather than one ethnic and cultural entity. The AUA has been very weak for the last ten years, especially in the time of Senator John Nimrod who did not know anything about the actual situation in Iraq including the differences that are centuries old, that exist among the different segments of our nation. Is it true that Mrs, Shwarten the sister of Senator John Nimrod donated a sum of US$ 5,000,000 to the AUA foundation? If yes, how come the previous AUA’s Executive board members and their respectful treasurers did not come up with proper audited accounts? Could the new respectable treasurer Mr. Joseph Jingo clarify and enlighten our Assyrian community since they are automatically members of the AUA’s UMBRELLA and have all the right to know about this huge some of money in detail ? Many thanks for all the above in advance for your kind answer to my questions. Dr. Mar Sarhad Jammo and the other Chaldean prelates are doing exactly the same damage in opposing the ChaldoAssyrian name. Same old story instead of uniting us they are splitting the Chaldean from the Assyrian and the Suryani. I have a sincere advise to both Mr. Noori Petrous Atto and Mr. Ablahad Afram Sawa and others brothers and sisters who are in the same political alliance. Start reforming yourselves instead of blindly following the views of your church leaders who also carry policies of divide and rule. It will be healthier for our nation if you started using your energy towards the unity of our nation. Start ironing your differences with ZOWAA and Mr. Younadam Kanna and other true Assyrian nationalists who are trying their best to unite our nation, regardless of their church leaders agenda and plans. Why should anyone be scared of the unification of our nation under the ChaloAssyrian name? Or, do you have your own hidden agendas? You must not count on the support of your religious leaders, neither their wrath, because they have deviated from the true teachings of Jesus Christ and have divided the Christian church instead of uniting it. And, when the time comes and the religious leaders change their agendas they are well prepared to drop you without a parachute. Mar Zakkai is really scared that maybe he will loose the adherents of his church and they might either join the Assyrian church or the Chaldean church so he is going as far as saying that all the Suryanyeens are Arabs, my suggestion to him is that he should completely change the liturgy of his church to Arabic and call his church the Arabian Orthodox Church. The Chaldeans and Suryaniyeens should realize that the animosity from the Assyrians towards their Chaldean and Suryaniyeen brothers was definitely prompted by none other than the Assyrian church leaders and their stooges for centuries. They are the experts in sowing the seeds of divisions instead of those of love and unity. Unfortunately, the same thing has also been demonstrated by the Chaldeans and the Suryaniyeens Church leaders. I would like to ask any true nationalist whether Chaldean, Assyrian, or Suryani who dreams about a homeland in Iraq, would he gain more if he goes separately, or if we all joined hands and went together as one united nation, we will be better off? I think any logical person will agree that “United we stand and divided we fall” except of course our Church leaders who would love to see us go on separately, so they can hold their comfortable chairs and control us for another seventeen centuries. Maybe some of the Suryaniyeens leaders are afraid that they might dissolve in Assyrianism or vice versa, or some Assyrians might think that after a few generations they might dissolve into Chaldeanism and so on. Why are we afraid to dissolve with each other? Isn’t it better to dissolve among our own Eastern Christian churches and peoples, instead of dissolving into Arabism, Kurdiesm,Turkmanism, Americanism, or Europeanism? Most probably our future generations will be very proud of our great accomplishment in the early 21st century that we were an enlightened generation and were able to finally break away from the chains of slavery, and free our nation from the hypocrisy and the dogmatism of our institutional Church leaders and finally we were able to unite unanimously under one name that of the ChaldoAssyrian. 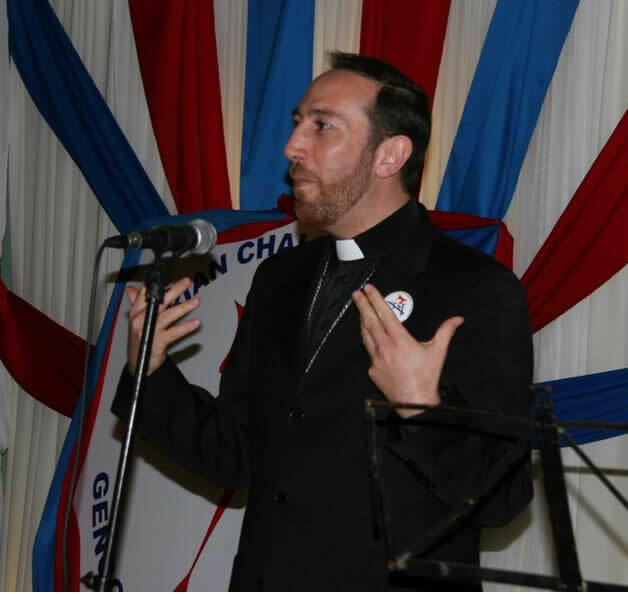 Mar Emanuel Delli lately changed his mind and contradicted his previous written letter in supporting the ChaldoAssyrian name. Now he openly wants to go under the Chaldean name with his newly found Chaldean parties stooges. How can our true National leaders rely on our church leaders? Mar Zakkai came up with a bigger bang and said that the Suryaniyeens are Arabs, and that Jesus Christ was an Arab as well. This is new to my ears, because I was told since childhood that Jesus Christ’s earthly father Joseph and his virgin mother Mary were Jews. (SUBHAN ALLAH) Don't be surprised tomorrow if they might call Jesus a Mexican or even a Kurd from the Barazani clan and maybe even a staunch supporter of the ancient KDP. Already some of our distinguished Assyrians in the north of Iraq, from the KDP are calling our Assyrian Church, The Church of Kurdistan. All our Church leaders have been very effective and are experts in splitting the true Christianity into so many different denominations each claiming that only through his true teachings you are following the steps of Jesus Christ. Sometimes I wonder to which church did Jesus Christ belong? What about if Jesus belonged to the real desert Coptic Rabbane of the Shheit desert in Egypt? This would really be catastrophic to the adherents of our Ancient Nestorian church, because they still consider us as heretics. On the other hand may be JESUS CHRIST truly belonged to the teachings of the Protestant Churches and not to any of our recognised Institutional Churches “Etawate Shlikhayeh”. In this case the Assyrian, Chaldean, Suryani, Maronites, Coptics, Catholics, Greeks and Russians are all doomed. Could our Church leaders please work and concentrate seriously together and iron out these important divisions among themselves first, instead of wasting their time in our national politics. Sometimes our national organizations play some pathetic roles such as the ADP in Syria, Just because their opinion differs from ADO “Mtaqasta”. And because ADO is in agreement with ADM position of endorsing the ChaldoAssyrian name so the ADP, is deadly against this unification. This was my impression when meeting with them two months ago in Tell Tamer, Khabour, Syria. Our National Organizations should reform to the needs of the 21st century and especially the events that took place in Iraq lately, that of the removal of Saddam and his rotten regime. All our organizations should quickly tear their old constitutions and re-write their new ones in light of the new Iraqi constitution, taking into consideration the needs of our people in Iraq, not in Iran, USA, Russia, Georgia, Armenia, Syria, Europe, or Australia. With my full respect to our national leaders in diaspora, and their limited knowledge of the actual situation on the ground in Iraq, they should be listening more carefully to our national leaders who are struggling on daily bases in Iraq and not in California, and in particular to the General Secretary of the ADM which is the strongest national movement ever since the downfall of our nation, who has been struggling for the last 26 years in Iraq, and whose members were martyred by the brutal regime of Saddam, and until now. Our charismatic leader is struggling to get us a small and realistic homeland in the plains of Nineveh in the western part of Iraq. It seems to me that most of our diaspora nationalist leaders, along with our church leaders, are very jealous of the ADM. My advice to the aforementioned groups is to pack up their bags wherever they are and go back to Iraq to the Crimson Zone. And, of course, they should be well prepared in some diving techniques, just in case some terrorist insurgent should come their way. They should also take in consideration that they might be sleeping in some very pathetic conditions, not the five star hotels that they are used to in diaspora. Once they have seriously taken this giant step then they can sit together on equal bases with ADM and maybe then they can elect a new leadership for our nation, but until such time we all should fully support the ADM’s true leadership in uniting all the segments of our nation under the compound name of “CHALDOASSYRIAN” and NOT the BRACKETS in the letter that was written by the Assyrian Church Synod in Australia and authorized obviously by Mar Dinkha which was read on Dr. Sargon’s pathetic AssyrianSat TV & Co. with Mr. Sargon emphasizing on the brackets over and over and over again. Our Nationalistic Organizations if they are ready to REFORM should wake up and realize that this is the 21st century. We are not in the Hakkari Mountains any more. The times of the Chief of a Clan: Agha, Mallik, Reyyees or other well known family names with long histories like Ashierattee, Shapetnaye, Urmyians are all past history. The rules of the 21st century are very simple. Any capable individual even if he is the son of a widow like General Agha Petrous could be elected and can become the leader of our Nation. We the ChaldoAssyrian, in diaspora should all go and VOTE. Keeping one thing in mind, do we want to vote in order to separate our nation? Then we should vote for slate 139. Or, if we want to vote for a stronger unified front with all our Christian brothers in unity and solidarity in Iraq, then, we should unanimously vote for the only unifying slate of Rafidain which is the ChaldoAssyrian 204. Note: In case the slate numbers are changed in the coming elections. Make sure that you vote for the ChaldoAssyrian with Syriac language as the culture. This article was written by a true Assyrian Nationalist who believes sincerely and with good intentions that the only PORQANA (salvation) for our Nation is through our unified name that of the ChaldoAssyrian in order that we can stand tall and proud. (ZNDA: Baghdad) The Ministry of Education in Iraq has issued a list the top ten high school students in Iraq and an Assyrian student appears on the list. Mr. Nohadra Philip Oshana from Dhat al-Nitaqain High School of the Rasafa Second District came second overall with an average of 94.33 out of a total 100 points. The First place student had an average of 94.43.